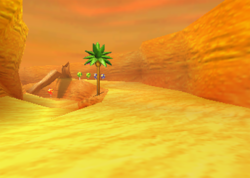 Fossil Canyon is the second track of the first world, Dino Domain, in Diddy Kong Racing and Diddy Kong Racing DS. The player must have at least two Golden Balloons to race on it, or seven for its Silver Coin Challenge (or Balloon Pop in the DS remake). This level offers considerably great challenges for new racers. The track has numerous Power-Up Tokens, exclusively in the game's remake, and many Zipper pads. Notorious for its fork in the road, both ways are quick. If the racer travels towards the left side, they will find a red balloon with a missile, but the other route has green and blue balloons for an offensive or defensive attack. 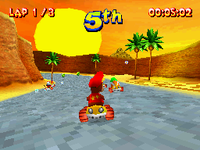 It does not feature any moving obstacles, but it does have palm trees which slow down players. DS version of the track. The track begins as a straight road with palm trees on the side. The road slowly curves to the left, and a giant dinosaur walks around off-track. Racers can then find a Red Balloon, which then leads to a lake, in which the path curves around. Racers can either collect the Bananas on the road or shortcut across the lake by using a nearby Zipper. This leads them in a tunnel, with a Red and Green Balloon lying outside of its entrance. The tunnel starts with a sharp turn to the left. The path goes briefly straight until taking a sharp turn to the right, where players can find two Green Balloons, two Red Balloons, and a Blue Balloon. Racers have an option to exit the tunnel from a Zipper. The tunnel leads outside to a bump with a Green Balloon in the center. After crossing the threshold, racers drive into a roadless canyon portion. It has two paths, the left one is narrow and bumpy and only has a Green Balloon beneath the small overhand. The right path is wider but has two Green and Blue Balloons. The paths intersect, and lead racers off small ramp with Bananas behind it. The racers enter back on the road and drive a straight pathway to the finish line. Like the other courses, Fossil Canyon has eight Silver Coins scattered in its area in the Silver Coin Challenge of the original version. The player can access this challenge after winning against Dino Domain's boss, Tricky the Triceratops. The first coin can be found in the center of the track near the first Zipper. The next coin is located right after the first set of balloons on the side of the road. In the Nintendo DS remake of the game, it is instead in the center of the track. The third coin can be found shortly after the second Zipper. Not too long after the second Zipper, a lake can be found to the left of the track. The coin is along the edge of this lake near a tunnel. Right by the third Zipper, racers can find the next coin. The sixth coin is located before a small bump outside of a tunnel. On the fork-in-the-road, a coin can be found in the route to the right. On the left route in the fork, racers can find the final coin. This page was last edited on April 8, 2019, at 02:14.